Mineral stains are a major problem with toilet bowls, developing mostly when you have a hard water supply that has a high mineral or alkaline content. This often leaves a dirty, discolored ring around your toilet bowl that sticks tightly plus leaves spots throughout the bottom of the toilet bowl. To remove this mineral buildup, you have to use a product that dissolves the mineral content without damaging your toilet or plumbing system. 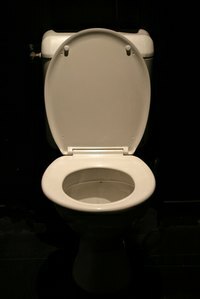 Pour 2 cups white vinegar into your toilet bowl. Let sit for 15 minutes. Scrub the toilet bowl with your bowl brush and examine to make sure all stains are removed. Flush the toilet. Pour 1 gallon white vinegar into the toilet bowl if mineral stains are still present, and this time let the vinegar sit in the toilet overnight. Scrub down your toilet bowl the next morning with the bowl brush and flush the toilet when all stains are gone. Repeat the 2 cups of vinegar step each week to keep the stains at a minimum.